High Seasonal Base in a Popular Vacationland! This one is so easy to operate! Immaculate, pride of ownership shows throughout! Expect great things when you visit this business! Paved roads, boat storage area, RV sales, and service (your choice to continue this revenue source), all full-service RV sites, 70 pull-thru sites, 9 expandable acres, clean, clean, clean grounds and restrooms, gated entry, peaceful, city water and so much more! In minutes, guests can launch their boat on 160,000 acres of water! Located just over a mile off the Interstate and a quick 2 miles from a Marina which has access to the lake. The location is ideal for boating, fishing, hunting, golfing, hiking, shopping, wildlife viewing and relaxing. The Lake hosts some 2 million visitors a year and the opportunity to enjoy outdoor recreation and countless miles of ATV and horseback riding trails! All of this, right in this parks back yard and visitors come from all over for a fun lake filled vacation!! No matter where you are in your search for a campground, this one has all of your needs covered. Paved roads, level site, pull through, and trees. Owners very friendly. Quiet country setting away from the highway traffic. Clean restrooms and showers. WiFi worked. I would recommend this RV park and will stay again if passing through. So clean and nice owners. We will be back. Very accommodating. Run a great campground. Long term campers are very friendly. Home away from home. Great place to stay! Clean. Convenient. Nice folks. Good value. We’ll be back. Hidden away in the picturesque foothills of the Blue Ridge Mountains where the beauty of the ancient hills magically embraces guests with its amazing scenery, a river too beautiful for words and seriously one of the most peaceful places in the state! It’s so magical! Its 34 acres are bordered on two sides by a US National Forest Land and a designated Wild and Scenic River Area. This unique property isn’t just a campground, it’s an event hot spot! The focal point of the Resort is the beautiful post and beam Lodge, with soaring ceilings, full-length windows, a full-service restaurant and bar, both indoor and outdoor stages for live entertainment, beautiful marbled terraces with a stacked stone fire-pit and a tiki hut. The lodge is convenient, quiet, comfortable and the perfect gathering place for guests. The resort offers a variety of accommodations, from primitive tenting to climate controlled guest rooms. The campground is gorgeous with the right amount of privacy at each campsite and a perfect view of the creek which runs through it. Its three-stage areas host several music festivals throughout the year bringing guests from three large metropolitan areas! The current owners have renovated much of the property to include new plumbing, electric, graveled roads, along with hiking trail and campsite improvements. Fully operable and up to code commercial kitchen and bar. Recent purchases include new bedding, towels, barware, and in-room TVs. This is a wonderful opportunity to own a beautiful Resort that has been lovingly cared for. Ease out of the fast land and float down the St. John’s River to Astor, Florida, a small fishing, and hunting community with marinas, shops, and restaurants surrounded by timberland and farmland. This ten-year new RV Park offers a premium stopover for the largest RV’s on the road and boasts 5-star ratings across the internet! Voted one the “Nations Top Parks” by Good Sam’s and located less than a half mile off a major interstate with 35 x 70 pull thru and full– service RV Sites! The wide paved lanes will handle the biggest of RVs, even with a tow and they have the bragging rights to being the cleanest and most well-maintained park off the interstate! Nestled in the foothills of the Smoky Mountains, this is an ideal location to live and work at your very own secluded cabin resort! The seasonal climate, natural beauty, abundant recreation and its proximity to larger markets are all factors to make this one great place! All it needs is a visionary, marketer, and you wanting a lifestyle change. Imagine life operating a cozy, cabin resort set so peacefully in the woods with gorgeous mountain views and your very own 22 acres to hike! This is what getting away and being your own boss is all about. There is a 2 Bedroom / 2 Bathroom stick-built owners home with a 2-car detached garage. The cabins are in good condition with the exception of one that needs a little TLC. All furniture is included in the sales price. This Seller owns another business and has not given the resort much attention over the last few years. Operational? Yes. Income supported? No. Potential? Absolutely! Ready to pack up the family and head to the mountains? We’re super excited to talk to you about this great park! There’s a good chance that you’ll be wanting to learn more about this resort so give us call and we’ll share all the details not mentioned in this ad. Almost Home RV Park, one of the few RV parks open all year in the Springville, TN/KY Lake area, offering daily, monthly and yearly sites with several yearly sites under contract. There are 43 lots with electric and water and 17 of those are full hook-ups. There are 4 cabins included and the owner is adding more. The property includes a laundry room, office building, music stage and 2 bathhouses with 2 showers, toilets and sinks in each. The owner’s personal home, a 3 bed 2 bath 1680 sq. ft. mobile home is included in the sale of the property. Paris Landing/KY Lake is a great area for water sports and some of the best fishing in the country. Take a look at this opportunity. Tennessee is a great place to visit and a great place to live! If you are looking to move to Henry Co., TN and haven’t sold your home, owners would consider partial trade of existing home as down payment if approved or other assets would be considered as well. Take your lifestyle to a new level in this move in ready, highly rated RV Park! Immaculate and well maintained, you’ll find this turn-key park is easily managed by one or two persons. Just bring your suitcases, the kids and don’t forget the dog! One thing is for certain: Nothing gives you that fresh start feeling like a move in condition, clean and comfortable RV Park. This highly rated, upscale and big rig friendly business is just four miles off the interstate, has great elbow room between sites, wide roads, city services, clean, clean, clean restrooms, raving reviews, an awesome marketing plan in place, and white glove test ready! 40x60 Metal Building houses the camp office/registration area, restrooms, guest laundry, and storage area with an overhead door. Welcome to this excellent business opportunity! The area is secluded and peaceful with winding mountainside streets and block after block of one-of-a-kind shops. Visitors come to this area for the festivals and events that span everything from blues, jazz, and opera to car shows, antiques, and the arts. Add to that, a wildlife refuge, zip line tours through the mountain forest, steam trains, caverns, music and magic shows and so much more! This park is located in the heart of this popular resort town and is the perfect base camp for all of the area activities! It’s an idyllic mountain village with a temperate climate and four distinct seasons. Developed 2007, this nearly new RV Park is in an area full of rolling hills where the quality of life runs high! The cost of living remains low in this county however the city has a robust and diverse business community. The attraction to the city is a world-class entertainment and educational park with more than 70,000 square feet of exhibits focused on nature, science, technology, history and art and 50-acres of gardens! A major portion of the income generated is derived from repeat clientele showing that the reputation of this business produces consistent sales and profits. It can be run profitably as a family operation or by a sole owner. The well-established customer base ensures the stability of the business and its integrity generates high local support. The business has a substantial market share of its trade area and the potential to increase the customer base, sales, and profits are very good. The community supports the business to a high degree. These owners are turning campers away every day so expanding the park is needed. Good overnight stay. Convenient to highway. Would stay there again. Sites are decent with adequate room. Small RV Park, clean and pull through. Friendly staff, clean washroom, and laundry. Close to shopping. Very good internet. Would stay here again. CITRUS COUNTY FLORIDA – LAST YEAR WE HAD 1.5 MILLION VISITORS TO CITRUS COUNTY! LOCATED IN INVERNESS FL., THIS 19.5 ACRE RV SITE HAS VAST POTENTIAL. THIS PROPERTY IS LOCATED DIRECTLY ON THE RAILS TO TRAILS WALKING, BIKING PATH CONNECTING TO OVER 400 MILES OF TRAILS. THIS PROPERTY IS WALKING DISTANCE TO DOWNTOWN INVERNESS, BIKE TO FLORAL CITY OR DUNNELLON. HOME OF THE MANATEES – CRYSTAL RIVER FLORIDA IS A SHORT 20 MINUTE DRIVE. BIG LAKE HENDERSON IN INVERNESS IS BASS FISHING HOTSPOT! THE INVERNESS ‘BIG BASS CLASSIC’ DRAWS HUNDREDS OF ANGLERS TO THIS FISHING EVENT. BUILDING CONSTRUCTION PROJECTS WOULD ALLOW FOR APPROX. 150,000 SQ. FEET WITH ALLOWANCE FOR PARKING, PERVIOUS, IMPERVIOUS AREAS, DRA’S AND VEGETATION BUFFERS/SETBACKS. Rated in the top 100 Good Sam Parks! This one is sure to please even the fussy buyer. The overall condition of the property is impeccable. The land is slightly rolling to rolling with scattered hardwood trees and tall pines. Graced with undeniable southern charm, three spring fed fishing ponds, winding roads, rocking chairs under covered porches and a resort feel all in the stillness of the countryside. 1. The RV Park consists of 102 RV Sites of which 101 are Full-Service and 97 are Pull-Through Sites. 2. The Mobile Home Park has 29 Sites and is located on the northeast side of the property and does not interfere with the RV Park. Rent is $200.00 a month and electric is billed individually to each tenant monthly. Park owns one mobile home, all others are individually owned. Graduating from a University with his sights set on an exciting career as a US Marshall and then a jet-setting private investigator, this owner seized his opportunity and never looked back! She was giving massages to dancers, famous wrestlers and weekend warriors, which she left behind, bringing her talents with her and her dream of owning her own full-service spa. It’s all about two people, bringing their individual God-given talents together, reaching for the stars and never thinking twice about what they left behind. What a success story! Is it time to write the next chapter in your life story? Perfectly positioned in the Mountains attracting visitors from a 300-mile range! The superior location provides excellent visibility and easy access in a vacation destination for the three heavily populated urban centers to the south! The determination of the fair market value for this property is based on its proven record of profitable operation and the continuous operation for 38 years, which have significant value! The gross income has a history of stability and periodic increases and the number of repeat customers establishes its base of income and suggests that a quality outdoor experience is provided. Combine that with its appealing and visible location on the river and within driving distance to high urban centers, and you get a perfectly positioned business in the Mountains! Remember, we must rest on occasion too, so you’re most likely to get ahold of us between 9 am and 5 pm EST M-F.
It’s a perfect place to call home! Situated deep in the Ozark Mountains this destination park is surrounded by stunning natural beauty! Its location is to die for and this town is in a world of its own! It’s a popular region for retirees and vacation-home owners because of the tranquility of the area and a place popular for float trips, festivals, lake weekends and world-class fishing. It’s a comfortable, welcoming place to live. We got the last cabin available and it was the cutest!!! Our cabin was adorable. This place is a return stay for me if I’m ever back this way! My husband and I had never stayed at this campground and have friends that come up from MS every year. They asked us to join them for the weekend. They camped (for the week) and we rented a cabin and had an absolute blast!!! The cabin was spotless! Nice back porch (facing the river) with 2 rocking chairs, a picnic table and a grill. Nice clean bathroom. We’ll be back!!! If you’re looking for a place to park your camper and play in the creek, this is the place for you. Wow! I cannot express enough how wonderful it was to stay here. The cabin was immaculate and included everything we needed. Campgrounds were quiet, well maintained. I would absolutely recommend this campground to travelers looking for a family oriented and/or a clean/quiet place to stay. Nice grounds by the creek level and upper level. Cabins, RV and camp sites were well maintained and had a good layout. We camped very close by the creek and had a beautiful view of the water and bluffs! Would go back! Live On or Off the Grid in this Location! Home to beautiful overlooks, classic swimming holes, cool coves, and secret hikes! For the guest seeking a natural pool for dipping or a sight worth a hike to see, this area has got them covered. With thousands of acres in woodland, both private and public, the area offers biking, hiking, hunting, and much more for the nature lover. For the lake lover, there are two lakes that are major attractions for the area visitors. The county brings much to the table when it comes to small-town living as well as a location that enables one to make a short drive to take in two large cities. It is country living with the convenience of city attractions, where you can live on or off the grid. You could very well be among the 70 million Baby Boomers that are reaching retirement. Do you know how you are going to spend those years? This state was voted #1 as the best state to retire, the cost of living index is lower than the national average, its ranked among the best in the country for access to medical care, it has four mild seasons and is within a days drive to many major cities. Ready to hit the road to view one of the prettiest places on Earth? Centrally located to numerous midwestern cities offering lots of fun activities and attractions making this area a winning choice for visitors of all ages! You are going to love owning this truly unique park. In addition to the wonderful design and location, you’ll find over 11 income sources and special events that attract thousands of people from all over the region and this park is never lacking in things to do! This is the destination! Come to see what these owners are so proud of, it’s truly a very special place. Well over 1 million dollars went into the renovations in an attempt to re-position the resort in the marketplace. Now at the top of its peer group in the region with revenues steadily increasing each year and located in a city that is “on the move” we promise you won’t find anything comparable to this well-managed opportunity! Room to Breathe on 400 Acres! 14 Million People within 150 Miles! This is a one of a kind 400-acre resort located on a mountain top providing a vast array of outdoor recreational opportunities all four seasons! From on-site hiking, horseback riding and canoeing/kayaking to ATV trails, hunting, fishing, concerts, and weddings. This unique property is situated on all sides by a beautiful National Forest with waterfalls but is only a short fifteen minutes from the interstate. Help run RV Park requires very little maintenance. Located on 24 acres. 70 large sites. 50/30 amp metered on all sites. Located in the foothills of the Great Smoky Mountains National Park on Cherokee Lake in beautiful East Tennessee. Cherokee Lake is known for great fishing and recreational activities. Card’nal Cove Campground and Marina are perfectly located with an abundance of beautiful blue skies and fresh air. You are 1 hour away from Gatlinburg, Pigeon Forge, Dollywood and the mountains where you have numerous hiking & walking trails, and several local parks around the property with hiking also. The Campground has 73 sites with all with electric and water. The Marina consist of 24 covered slips and 16 uncovered slips, a ships store with various sundries and drinks. More slips can be added. A concrete boat ramp & fuel island complete the marina. There are 9 wood sided cabins that are completely furnished. Each cabin has a covered porch for enjoying the park and the lake. There is a playground close to the cabins for the children. A 16’X30’ swimming pool with fence and patio, a 30’X50’ pavilion with restrooms, lighting and picnic tables. Restaurant with eating area inside and a dining deck outside. Rentals include four pontoons boats, kayaks, and paddle boat rentals. The fee simple land is 7.64 lakefront land. The property tax rates very low in Tennessee and we have no state income tax make in the state. Close to Mountain Bike Trails! Conveniently located off Interstate 64 making it an easy drive from Washington, Baltimore, Richmond and many other mid-Atlantic cities. Healthy Gross Income at Nearly $200,000! Go ahead, step away from the hustle and bustle of your everyday life in the big city and plant yourself in a business perfectly located in the Alleghany Highlands, with scenic mountain views and where visitors to this area have more than sights to see! The people of this community treasure friends and neighbors and will welcome you with open arms! Guests to the park discover fun on land and water on two feet, four feet, on wheels or towed behind a boat. They bring their hiking gear, paddles, golf clubs, mountain bikes and fishing rods. The Amphitheatre was built in 2010 to serve as a place to have shows while the Historic Theatre’s $6.5 million restorations could be achieved. This Historic Theatre reopened in 2016 following the completion of the $6.5 million restorations. The amphitheater located beside it still has events scheduled there, but it pales in comparison to the four-story theater that still has the original chandeliers from 1905. This theater presents a diverse program of music, plays, and festivals. Open April to early October hosting 40 events, seating 500 people, bringing more tourists to the area! Bordering a National Forest and just 800 feet from the State Park giving guests more room to play! It is home to some of the finest mountain biking in the state, with nearly 40 miles of trails in the state park and just 4 miles from a 50-acre lake. You’ll feel right at home the moment you arrive for your tour of this business, so go ahead a kick off your shoes and settle right in, you won’t be going back home! 30 Minutes to the Gulf Beaches! So perfect for the retired couple looking to supplement their income! Looking for the “Perfect Park?” This is it! RV Park Reviews rated this park a 9.4 – Excellent. It’s a very neat, tidy and well maintained, nicely landscaped RV Park with spacious sites. This park has a communal atmosphere with friendly and welcoming folks. Lots of community activities with group dining at local restaurants and potluck dinners and parties. It is 15-20 minutes to the beach! With a nearly new infrastructure, easy to care for landscaping, top notch everything, you’ll spend more time with your guests and less time with maintenance. Turn-key Ready is an understatement! You’ll smile when you arrive. Southeast Mountains on 32 Acres! Living here will put you in the heart of the Mountains, amid a beautiful landscape of old growth forests, a historic downtown and vast farmland with an attraction that draws over 700,000 visitors annually. Located in the geographic center of the State, this area is rich in natural attractions and cultural venues. From NASCAR Races and golf courses to zip lines and a 51,000-acre National Forest offering hunting, trapping, fishing, OHV riding, horseback riding, scenic driving and lake boating and swimming. This is a destination area! Open all year offering lots of family fun with all the toys imaginable for the kids and adults too! This park is seven miles from one of the area’s biggest attractions, receiving more than 700,000 visitors annually! Located in a county that is within 500 miles of half of the nation’s population and largest markets! It’s small-town living at its best! You are centrally located to several large metropolitan areas and in just over 3 hours you could be at the coast! Living here puts you in the heart of the mountains with beautiful landscapes of old growth forests, historic downtowns, and vast farmland. You’ll experience four beautiful seasons, quality healthcare options, a quick 20-minute drive to an international airport and a cost of living about 10% lower than the US average. The city is large enough to offer a variety of activities and resources, yet small enough to make new residents feel right at home! Well maintained and suited to please! Meandering roads through wooded acreage, tent sites along the 2-3-acre pond, beautiful pool setting, a large covered pavilion, and expandable acreage. Everything is here, bring your marketing skills! The area offers a bunch of can’t-miss things to do, from outdoor expeditions to unique historic adventures. The people are the friendliest you’ll ever meet. They have a lot of hometown pride and it’s a place where you get to see the true America again, the kind of place where people still sit on the front porch and say hello to you! Here, you’ll find Mom and Pop everything, the way things used to be! Guests have convenient access to a major east/west interstate and the city is within easy driving distance. This family-friendly park is secluded and peaceful with wooded sites maintaining a 4.5 out of 5 on reviews! If you live in a major city, you’re probably spending a lot of your time every day sitting in traffic. That’s not an issue here! If you’re looking for a community where people actually have a relationship with their neighbors, you might want to give us a call to get the location of this fabulous park! Having the Great Smoky Mountains National Park at your doorstep is heaven for the 207 seasonal guests that stay at this park. Those seeking a base camp for the area activities find a refuge here because the owner has set aside 40 sites for that clientele. This area is alive with things to do! It’s a place of lofty peaks, rushing water, spectacular scenery and it borders 45 miles of the Blue Ridge Parkway, bringing in over 1 million annual visitors! Have you ever wanted to just pick up and move to the Smoky Mountains but can’t quite convince yourself to take the leap? Let us help. Seller Financing Available and So easy to manage! Located in a rapidly growing resort area and within 5 minutes from a city that has everything from major box stores, restaurants, theme park, to live theatres! Strategically located almost smack dab in the middle of the state with a quick 45-minute drive to two large metropolitan areas! Home to beautiful lakes, lush landscapes, and orange groves! With a large lake right across the street, guests to this park love living the lake lifestyle. The area boasts over 55 lakes to ski, wakeboard, paddleboard, kayak, flyboard, and jet ski. This is a “something-for-everyone” destination to visit, work, play and stay! Ready to live in a mild climate with lots of blue skies, sunshine, light breezes, and mingle with the winter snowbirds? Blue Ridge Mountains and Lake Frontage! Nestled in the foothills of the Blue Ridge Mountains tucked away on a popular lake where you can sail to the backdrop of the mountains, meander down a river or take a fast-paced whitewater adventure. They say time stops for no one but tucked away in the northeast corner of this state there’s a place that might cause you wonder. Transport yourself to a time before clocks ruled our lives and when doing things, the old way was the only way. Concerts and street dances, festivals and 4th of July Celebrations, you remember how it used to be. It’s still that way here. Give yourself permission to slow down, relax, and breathe. Leave your work clothes at home. 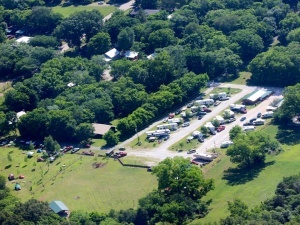 30 Acre full-service Jellystone RV Campsite located in the fastest growing county in Alabama. Baldwin County has some of the whitest beaches in the United States and is in the heart of a thriving tourism community. Our area is experiencing rapid growth, with the addition of OWA just 10 minutes away, a theme park similar to six flags, the future is very bright. Note: Recent Commercial Evaluation Completed. Mountains, streams, trails, lakes, caves, quaint little towns and major metropolitan areas are all within easy reach of this small unincorporated area. Hills and valleys give way to boulders and cliffs, creating a multitude of awe-inspiring vistas at every turn. This area has just about anything an outdoors person could want. The campground is surrounded by natural beauty and has two creeks which run on two of the four sides of the land. Twenty-Six log cabins, which can accommodate from two to six people are rustic and modern, some have baths, electricity and all modern amenities, while others have no services in them. 3 of the cabins are on the creek, and have a nice porch area overlooking the water. The area is perhaps as much a state of mind as it is a place. It is a small community between two vacation attractions that bring in more than 250,000 tourists each year and many visitors have made the life changing decision to build a new life in this area, so be careful, you might be next! Located in the land of rugged mountains, rolling farmlands, and deep, wild river gorges where the recreational possibilities are endless! Its natural beauty draws visitors from around the world! The Great Smoky Mountains National Park is the main attraction and is the most visited national park in the country! This park is located just over a mile from a heavily traveled Interstate, is mostly wooded with mature trees, extremely well maintained with a Woodalls Rating of 5W’s! Currently operated as an adult only campground, you could easily allow children. Paved roads, city water and sewer, privacy fenced maintenance building in the back of the park, lamppost street lighting and so much more! Appraisal completed in April of 2018! This price is on point! The Camp Registration building is approximately 1320 square feet and houses the camp store and game room. The bathhouse building measures approximately 1220 square feet and hosts the guest laundry and 2 upper level apartments. A 350 square foot pavilion with water and electric overlooks the lower campground. Guys will love the 36x60 (+/-) metal equipment building, privacy fenced and located in the back of the campground. 1 bedroom 1 bathroom 2015 Platinum Cottage Park Model serves as the owner’s home. If you love the natural beauty of the Smoky Mountain area, then you will be head over heels for this property! Located on 10 acres alongside a lazy/bubbling brook where families gravitate to enjoy the peace and serenity this park offers. An easy turnkey operation! Guests find so many reasons to love this little piece of paradise and so will you. I started camping at here about 4 years ago. Since my family has made it a second home, we go up for a week during the 4th and also a couple weekends here and there through the year. The facilities are top notch and the Smiths are such nice folks! The kids run around, ride bikes, and play in the creek and have a blast. Also it’s quiet and peaceful! if you are looking for somewhere close to fun or just somewhere to relax for the weekend this is the place! Spent the weekend at the Campground, and I would like to say I pride myself in leaving a campsite in better shape than I found it, I was unable to do this because the camp site was SPOTLESS when I arrived, Shower area is the best I have seen in any campground, and better than a-lot of hotels I have stayed in! Nice hike to the lake from campsite, lots to do in the area, we will be back! This campground has by far the best facilities we have encountered in the 11 states that we have camped in, be it a state park, national parks or private campgrounds. The showers and toilets were clean and tidy with adequate cubicles for the size of campground and believe it or not Wi-Fi in the woods, crazy but true. The owner was very helpful and friendly. Brilliant find and thoroughly recommended. A very special spot with a stream, towering trees, and very thorough and caring maintenance. Been here before and be here again. Owners on premises and the showers, toilets, and laundry are kept clean many times a day. Everyone we’ve met is a prior guest and you can see why. The main building, which houses the newly renovated registration area also houses the covered pavilion/deck which overlooks the park, the whirlpool spa area and game room. The lower walk out level has the men and women’s bathhouse, guest laundry and a workshop/garage. This building was constructed with high quality workmanship! Experience living in small town America and enjoy the great outdoors! The sign reads “Population 33” at the city limit and the cemetery contains more headstones than people residing here. It might be a small town, but its big on beauty and charm! Don’t let the size fool you, because it’s all about location, location, location and this little town is prime, all laid out so perfectly along the banks of a National River and in the Ozark Mountains. These owners saw a need for a campground in the area. So many people come to float, canoe and kayak this popular National River so why not? So, off to work they went. They choose the land carefully and settled on a five-acre parcel surrounded by mountains and the river. Construction began in early 2012 and by the start of the season they were open for business! Now into their fourth season, business has increased as expected. This park is perfect for the retired couple looking for a little something to do during their golden years. If you are retired, have residual income and want to keep a little busy, then paddle on down and take a look! The cost to construct this Park cost nearly $600,000! Nearly new everything keeps the expenses down and gives you a better bottom line. Near Perfect Scores in National RV Park Ratings! You will absolutely love the ease of management this park offers! Not only is this park in excellent condition, it also provides a large, heated RV repair shop which is insulated with 4 bay doors, hydraulic lift, office space, a bathroom, and a second-floor storage area. This park is adjacent to a brand new, three million dollar tourist information center! Talk about location and visibility!! Nestled in the pristine Ozark Mountains where motorcycling meets vacation! This area is fast becoming one of the most popular locations for motorcycle riding in the US! Because of its unique location, guests can enjoy the wild outdoor adventures on a National River, take short side trips to some very popular vacation destination areas, or fish, swim and boat the close by lakes, rivers, and streams. A place that offers simple, relaxing, family orientated living! Open Three Long Weekends a Year! Located in a city of recreational parks, a city in transition and a city on the move! This city provides visitors with a broad range of activities from music concerts and farmers markets to an OHV outdoor recreation park! This park is open in April, May, and October for the area’s event that draws in excess of 150,000 people! Imagine being open just 3 long weekends a year! This park has the potential to host music concerts and currently they cater to rally groups, dog shows, weddings, proms, school and church events in the large Meeting / Event Center. This area is certainly blessed with picturesque rivers, mountains, valleys, streams, lakes and is conveniently located within a day’s drive from several states. This cute mountain town is the gateway to a National Forest and a National Scenic Byway providing visitors opportunities for hiking, bicycling, fishing, and kayaking, backpacking, and motorcyclists flock here to meander through the Smokey Mountains. With comfortable year-round temperatures, a low cost of living, and easy access to urban amenities, this quaint town is a desirable place to live and run a business. Many people have left the rat race behind and happily relocated here, embracing a lifestyle which balances making a living with enjoying life. Are you ready? These Owners built this campground with a dream and a hayfield! The main building houses the camp registration area with a small selection of resale items. Measuring 28 x 41 it includes the bathhouse, guest laundry, and a storage area. A 2000 gallon septic tank services the entire campground and there is no zoning in the county. The immediate area is remote from the business district and is mostly surrounded by open lands with some scattered residential homes and commercial uses along the highway. Traffic is increasing in the area overall due to the location and the major road that leads to the mountains. Open March through October catering to adult motorcycle riders. Located just a half mile from the entrance to Americas most visited National Park where visitors come for the fresh mountain air and starry night skies. Offering a wild playground for the most traveled adventurer, this cute mom and pop is surrounded by mountains and beautiful forests. Tourism is the lifeblood of this town. Summer brings many tourists but is rivaled in popularity by the changing of the fall colors, extending the tourist season until early November. The town is less commercialized than their neighbors and is slowly growing, moving towards the services direction opposed to theme park and entertainment attractions. Stores and restaurants are increasing in numbers; Hotels and Motels are being remodeled and new ones built. It’s a small but growing town where there is still a feel of southern hospitality. 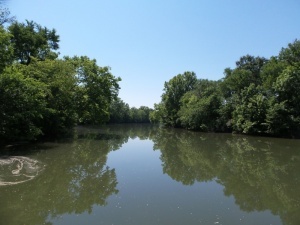 The land comprises of 3 (+/-) acres with river frontage. Fishing the trout stocked river right from the park is the most popular activity with tubing/kayaking/canoeing, hiking, bike riding and horseback riding all pulling in a close second. The business is open 9 months of the year, giving owners a 3-month hiatus. Location important? This park sits on the main drag through town, leading guests straight into the national park. Arrowhead Campgrounds sits on 23.13 AC located in Marianna, FL just 60 miles from Tallahassee, the state capital. Located on the famous Mill Pond with nearly 1,000 ft of accessible shoreline and boat ramp on property, it boasts amazing fishing and canoeing. On the property, there are 6 cabins, 7 park homes, and 150 pull-through campsites with hook up. Guests are also able to enjoy a large swimming pool, laundry facilities and a day room with patio. Arrowhead Campgrounds is just 5 miles from Florida Caverns State Park, an attraction that over 100,00 people travel to see annually. Arrowhead Gas Station and RV Sales are also located on the property with 180' of frontage on Highway 90. This includes the Arrowhead Gas Station and Convenience Store as well as Up The Creek Café. A full-service restaurant located on site complete with a bar and large kitchen. Other buildings on the property include mini-storage warehouse space that can be rented out, a 6,000 SF Shop with three large rolling doors, and another smaller shop with 2 large roll doors. There also is a single-family home located on the property. Located in Jackson County, Marianna is a rural community in northwest Florida. Highway 90 runs directly through Marianna connecting it to the state capital approximately 50 miles to the east and Pensacola to the west. The subject property is located on Highway 90 near State Road 71, another major thoroughfare that runs north-south. This area has been experiencing continuing growth due to its location and support of commercial growth by the local government. The subject property is surrounded by mostly commercial zoning comprised of mostly retail stores and gas stations. Dreaming of a simpler, healthier lifestyle? There is nothing more satisfying than living on and owning your very own business nestled on 11+ acres of lush greenery, water views, and natural beauty! This is a fantastic opportunity to own a secluded yet easily accessible, turn-key RV park with boating, fishing, great hunting areas, and shopping close-by. Conveniently located to a popular highway corridor for “Snowbirds” traveling to and from Florida from the upper Mid-West, and with relatively mild winters the park is an attractive alternative to higher-priced Florida parks for “Snowbirds”. 3 travel trailer rental units that have kitchens as well. Some yard tools, rakes, shovels, etc. Situated on 11.5 secluded acres at the end of a paved road, the property is less than 1/4 mile from the mouth of a large river by boat. There are 2 public access boat ramps very close-by to launch boats and enjoy the river to fish, ski, canoe, or kayak. The park is less than 2 miles from a small town, convenient for quick shopping trips, less than 20 minutes from a larger city for more variety of Shopping, Dining, and Entertainment. While off the beaten path, the park is a reasonable drive from Atlanta, Birmingham, Mobile, Pensacola, and Tallahassee, for weekend and Holiday getaways. A High Tourist Destination Area! Step into this town and you’ll be stepping back into the rough and tough days of the wild west. Now a tourist hotspot, it’s a place where you can still hang up your cowboy hat and dust of your chaps in its numerous saloons, restaurants, and shops. Visitors always find more than enough to do and see in town and this park is perfectly positioned within blocks of all the fun events! With a mild year-round climate, this area is perfect to visit any time of the year. Sellers are in their 80’s and want to retire. 250' Pier on The Gulf of Mexico! Ho Hum RV Park is a unique two season RV Park directly on the Gulf of Mexico in the Panhandle of Florida with pier access to the Gulf. The area is a haven for visitors who love the coastal outdoors but shy away from crowds. With its three pristine rivers and the Gulf in its front yard, guests to this park have access to salt and freshwater fishing opportunities and Oysters! Guests come in the summer to hook the big one and winter snowbirds come for the beautiful beaches and the down-home “Old Florida” feel. No high-rise hotels or condominiums, no four-lane traffic congestion, just good ole peace, and tranquility, it’s no wonder this park boasts a 75% repeat clientele! These owners have made Ho Hum their home for the last 21 years and while the decision has been hard, it’s time for them to retire! Aurora Oaks Campground is in Aurora, Kentucky. Located 1/2 mile from Kentucky Lake and Lade Between the Lakes Recreation Center. The campground has 50 acres so plenty of room for expansion, outside RV storage, or just keep the KY woods as they are. After entering your private driveway to the campground, the quietness is as if you were in the middle of the wilderness not just ¼ of a mile off Highway 68. The campground, previously a KOA has a beautiful office where campers can visit to keep you informed on their daily catch, they my even invite you to the several fish fries that take place. The 90% seasonal residents are friends where you will see nightly gatherings. It is a family friendly campground that shows tremendous pride in ownership. Small living quarters above the office for your privacy. There is a full kitchen adjacent to the office for yourself or preparation for potlucks and Holiday celebrations. There is a 50 x 100 foot shed to store all equipment and maintenance gear. The equipment stays with the property. Step off the treadmill of a busy life and be ready for the serenity of owning Aurora Oaks Campground. A place where tenants are like family. Peace and Quiet all Around! Low Key, Easy to Manage! Nestled between two large metropolitan areas allowing for access to many of life’s pleasures while staying unspoiled by the urban sprawl. It’s a place where people come to chip, putt, paddle, cycle, race, raft, kayak, hike, fish, and just have fun! This owner started building this campground in 1998. His vision was to build a place where people could come and unwind after a long week in their city life. He wanted to preserve the sounds of nature and keep on hugging trees! This is a no-frills park allowing you the opportunity to relax and enjoy its seasonal camper base and the sweeter sounds of life! EXPANSION OPPORTUNITY – 8.3+– neighboring acres w/ 242ft of HWY frontage for sale at below market price. Public boat ramp access less than 1 mile away. 3 overflow sites are water and electric. Cable TV on every lot. Electric is metered 30amp sites for trans. and 50amps for permanent. Gross income equals current occupancy as of July 2018 and actual transient RV income from 2017. BROKER’S OPINION: By filling 22 Sites w/ park models at market rates of $300 per month, gross income will be over $280,000. Located in a bedroom community and literally at the center of it all. Commerce, tourism, outdoor activities, its all here! One of the great things about this area of the state is the variety of activities available within a short distance. Yes, it is possible to spend a day on the trails and a night on the town without driving more than an hour from one adventure to the next. The property has been in the family since the early 1900's and this owner seized his opportunity to build this park in 2003 when workers were coming to the area for the natural gas extraction. He started with 10 sites and over several years expanded the park, building mobile home sites, cabins, and RV Sites along the river. Some sites are spread out on its 40 acres with the main park designed in a more traditional manner. Lots of room to expand and build on what this owner developed. A complete training, events, conference, and lodging. Facility on 90 +/– acres nestled in the heart of the 53,000± acre Goethe State Forest, boasting over 100 miles of trails. * 4,300± SF clubhouse and conference center with bathrooms, fireplace, dance floor, office space, speaker system, storage and laundry rooms, built-in projector screen, sound absorbing panels, extra high entrance for access for oversized items, wrap-around exterior deck, a stage area for music bands. * Facility nestled in live oaks and specially designed for the outdoor– and horse-enthusiast in mind. * An ideal “destination” RV Park for snowbirds, outdoor enthusiasts, and trail horse camper adventurers with paddocks, stalls, and cabins. * Adjacent to thousands of acres of state forest for hunting, birding, biking/hiking, horse riding/driving, and wildlife viewing opportunities. * This facility has been in operation for over 17 years and has hosted thousands of people from all over the world and hundreds of events including horse driving trails, music festivals, clinics, annual meetings, dog herding trials, jack terrier races, riding obstacles, summer camp, endurance rides, 5K trail races, carriage paces, weddings, indoor pickleball games, family and work outings, and much more. * 45 RV/camper hookup sites (16 with water, sewer, and electric (30 and 50 amp) and 29 with water and sewer only, and pristine private rough camping locations). * Miles of wood-fenced paddocks, creating 75 good-size live oak shaded turnouts and interlocking gate systems for added safety and security of horses and other livestock movement.